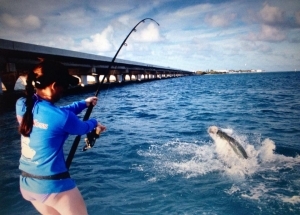 ← 4/14/13 Key Largo Tarpon Fishing stays strong! The april key largo tarpon fishing is holding strong. Boated fish practically every day this month with multiple hookups and evening multiple landings not uncommon on a trip. The day bite has been fantastic most days in the backcountry. Local bridge/channel fishing around key largo fishing has been good too in the evenings. Live mullet, fresh dead mullet, and the occasional crab have been the baits of choice. We caught 3 out of 4 today, we caught 4 out of 6 yesterday/night , 3 out of 6 the day/night before that, and so on. If a key largo fishing charter is in your future, shoot me an email and lets discuss!